A.L.T. is the latest release from Clan [B0S], a Russian mapping commune whose previous releases include Da Will and Sacrament. 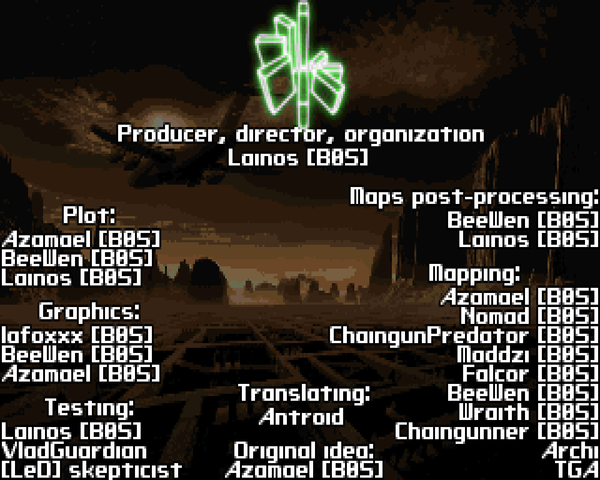 Here they have pooled their considerable talents together to create a full-fledged Doom II megaWAD for Boom-compatible ports, directed by [B0S] veteran Lainos. A.L.T. 's story is pretty simple; you begin as the sole survivor of a plane wreck, finding yourself in a strange world populated by hostile forces that resent your presence. You fight to survive, and to discover the reality of your situation, encountering a variety of worlds during your progress. The ankh is a prominent motif you'll see throughout the mapset, a nice choice of foreshadowing. If you disliked Sacrament for being big on visuals but short on gameplay, A.L.T. is a huge step up in the latter department. Most of A.L.T. 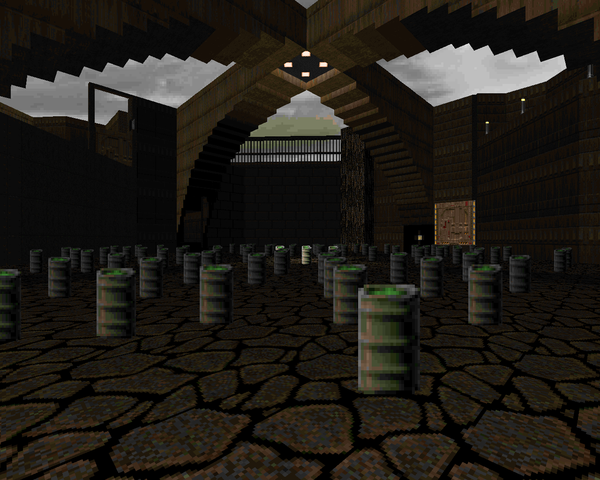 's maps are closer to classic Doom II action, featuring layouts you can explore without getting lost in. Actually, I'd say it's hard to get lost in most of these levels. ALT is pretty linear, with quite a few of its maps dedicated to telling the story; the biggest challenges you'll encounter are usually puzzle-related. I love puzzles, though, so I'm right at home. Keep your eyes peeled and prepare to execute dazzling leaps. Clever Doomers will find scads of secrets to help facilitate fighting, the better to complete their journey. The WAD is a bit uneven, but not in a way that hampers it. There are in general two types of maps in A.L.T.. Some are smaller, more traditional outings (particularly from the newer authors), which help to break up the larger, more ambitious pieces, like Maddzi's "Recall", which is simply massive. There are a few levels that are both short and evocative, easily recognized by distinct visual hooks. Brevity contrasts well against (still excellent) enormous, exploratory affairs, some of which come from veteran Kolybenko "Azamael" Michaeilo, responsible for some of Sacrament's largest offerings. [B0S] has pulled up a lot of new eye candy, used to great effect to freshen things up. A few (well, one in particular) is downright silly, but I think the Duke can stand to take some ribbing. The Clan has elected to refrain from weapon replacement graphics, though they've ushered in a host of noises for you to get familiar with. You'll also see a new, gorier death for the revenant, and a few brand new monsters. Well, they're actually specterized versions of a couple regulars, but they aren't quite the same, as you'll find out in the few instances you encounter them. The soundtrack is all MIDI, too, for those who prefer a more classic feel. A.L.T. is a cool megaWAD that, supposing nothing I've already mentioned puts you off, you should play. In spite of the number of contributors, the hard work of Lainos and Azamael results in a fairly consistent narrative that's easy to pick up during your inter-dimensional romps. Throw in puzzles, generally good gunfights, a few idiosyncratic gems - I'm sold. Your mileage may vary, particularly if you're not used to looking for unusual switch arrangements and a few sequences that are more frustrating than fun. Even I had to throw my hands up a few times. Regardless; enjoy A.L.T..
A very weird opening. You start observing a body frozen in agony. Abruptly it disappears, you feel a shock of pain, and you realize you're on a plane overrun by... Nazis. Well, the plane interior looks nice enough, but the real action begins when you peek into the cargo hold. Things aren't what they seem, with the rear end of the spacecraft giving way to some demonic corruption. When you reach the end, you blink back to reality before you suffer another shock – and things abruptly end. It's a pretty good story piece; I prefer it to Sacrament's opening. I think they could have picked a sprite replacement for the SS Trooper, but whatever. It looks like the valley of the plane crash was next to a city, where "Dies Irae" takes place. It's a large, open level, with tons to explore and do. The opening may give the impression that the map is packed with action, but the encounters are more incidental than anything. It's more dangerous than the previous two, though; you'll want to be on the lookout for revenant ambushes. 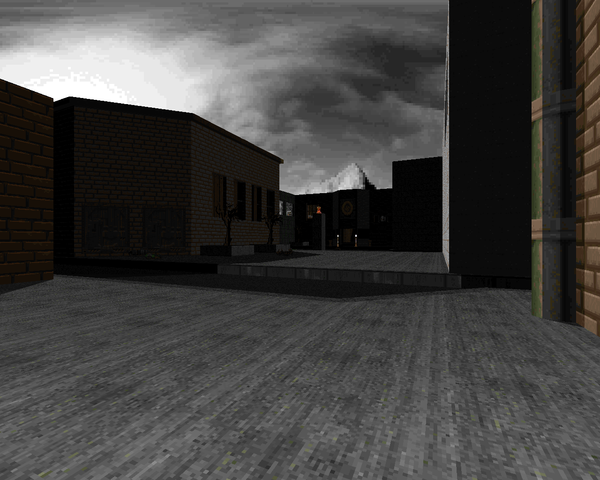 I had a lot of fun checking out the city, with areas like a warehouse, a dormitory (with a diabolical secret! ), an unholy cathedral, what looks like a...post office...? I have no idea what was up with the arch-vile making noises at the map's beginning, though. I must have done something wrong, because I never saw him. Azamael follows things up with a short, unusual rooftop chase. Well, you're the one being chased, by a bounding Cyberdemon. It's very forgiving; if you fall, there are teleporters all over the place to return you skyward. It's mostly nerves of steel type rocket dodging, the hardest bits being over irregular paths, like perpendicular lines of poles or thin, zig-zagging walls. 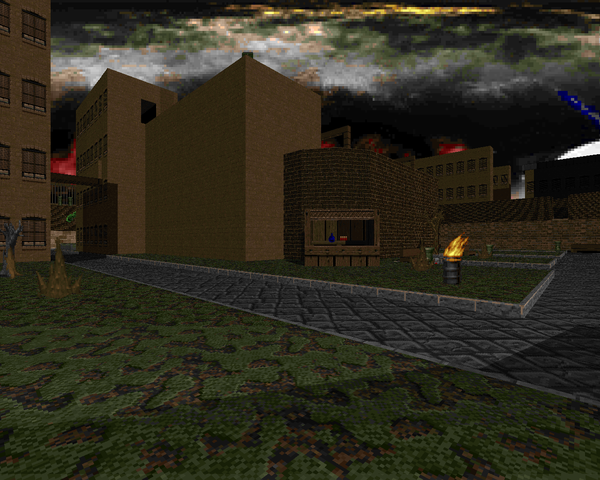 This is another large level that, like "Dies Irae", takes place in an urban setting. Here you'll explore a railway station and the surrounding buildings. In contrast to MAP03's exploratory gameplay, MAP05 is quite linear, though you'll have a few puzzles to navigate on your way to the railway car that ends the level. 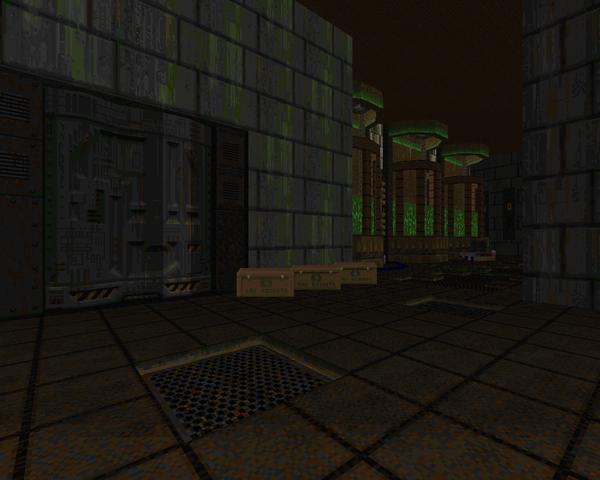 The early section kind of drags with a room-by-room hunt, but after that you get into some more typical Doom action. My personal highlight is a tiered series of walkways patrolled by imps; as you climb forward, Azamael unleashes cacodemons to harry your progress. 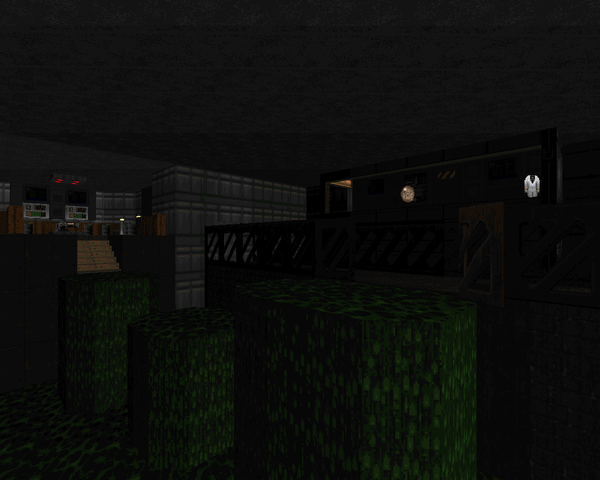 The main railway area is quite stunning, a great centerpiece for the level. 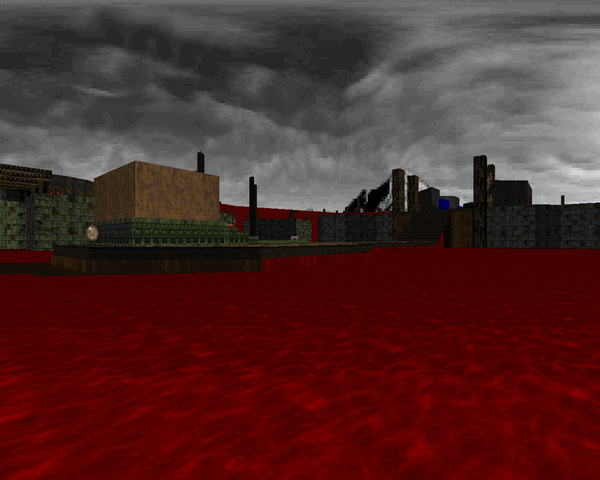 It's another large map that takes you through more of the urban Hell, and then a more explicitly infernal landscape, with some marble platforms peeking out of an enormous cistern full of blood. When you make it to the second half, you'll have to perform teleport jaunts to other locations to raise the missing sections of the bridges. I like exploring the opening; it's got a ton of secrets and leaping puzzles. Backtracking to the red key and then going back through that long, boring corridor to the north is annoying, though. The rest is pretty cool, bringing to mind some of the trippier sections of Sacrament. 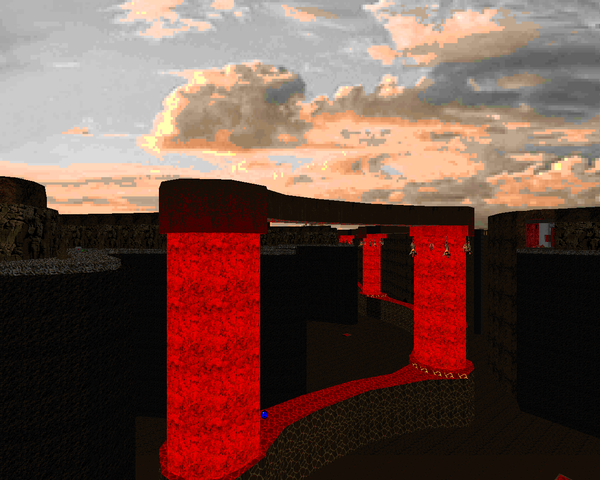 I enjoyed the grand, yet simple architecture of the bloody caldera and the little wings you teleport to (including the bizarre northwestern area). This is an odd map split into two parts. The first is pretty simple and is an outdoors landscape with a bunch of arachnotrons in cages followed by - once you get past the ravine - two hordes of demons with a few barons. When you clear everything out, you take the teleporter on the beach to what looks like a pirate fortress, surrounded by ships manned by mancubuses (and a larger platform, on which rests a Spiderdemon). The fort is typical room clearing, with the actual difficulty arising once you leave the safety of the fort, given the monsters patrolling the decks outside. Archi breaks into the lineup with this tricky, predominantly techbase map filled with devious twists and turns. There are some unusual jaunts to otherworldly locations, including a short, satanic mirror of the main area, and an unusual encounter with a number of revenants in some shadowy plane. It's more puzzle-driven than some of the previous levels, demanding inquisitiveness from the player, especially once you reach the segment that's hidden on the automap. It's preceded by a nice little elevator fight with more revenants. Of all the rooms, I particularly liked the easternmost chamber. It's large, for a nice firefight, and the bright blue tracks in the floor give it some much-needed flair. 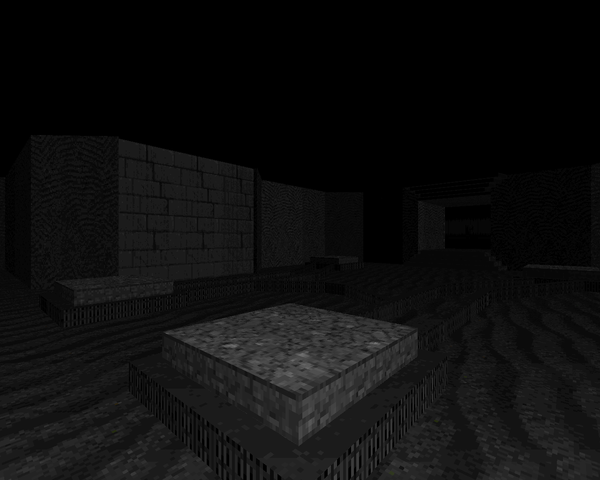 This is an outstanding, short map where you enter a machine to find yourself in some kind of ruins frozen in time, accomplished via a washed-out group of textures made to convey this otherness. You'll find some enemies in the dead time, but they're mere shadows, and difficult to see in Archi's carefully constructed paradigm. The spectres seem at home here, but the other beasts are propelled to great lengths from your mere bullets. Stepping back into normal time comes as a relief, but the author isn't finished yet. Is Billy Pilgrim unstuck in time? Pretty short, abstract map themed around a main area with multiple tiers of action. 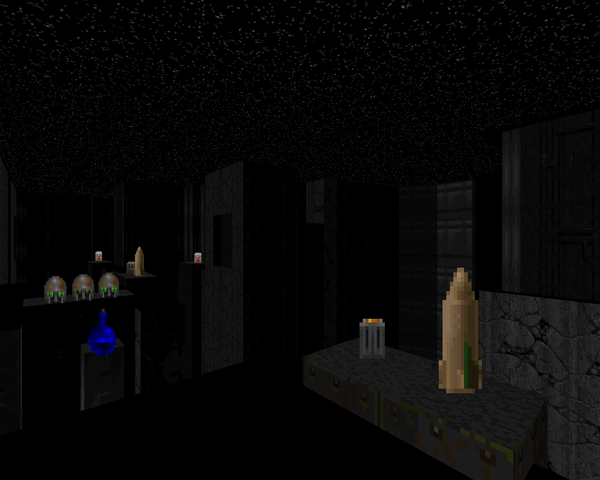 I'm not fond of that starry sky texture being just plastered on the ceiling, but so it goes. 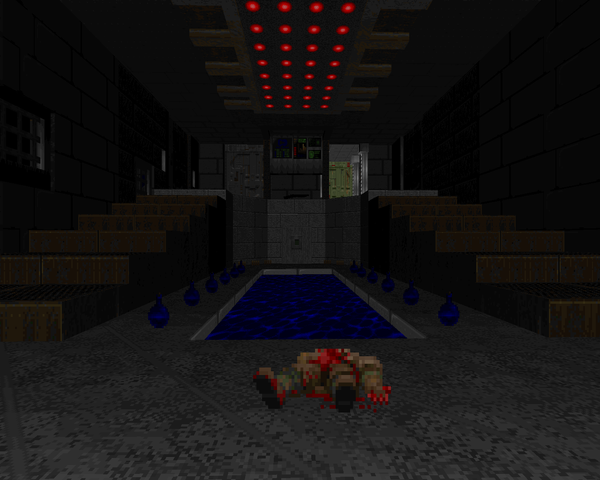 It's a little brutal on pistol start, with the standout encounter being the yellow key trap, a series of rooms packed full of monsters that can get out of hand quickly if you trigger the doors to the side areas too quickly. Check everywhere for secrets – they're easy to find and you'll be sorry if you skip out on the plasma rifle, BFG, or other handy powerups. 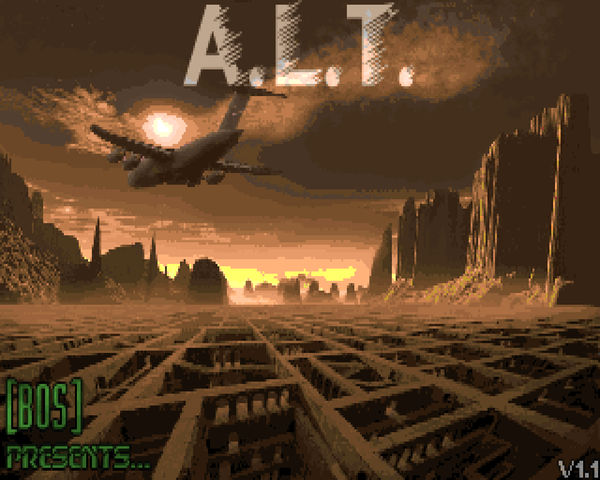 "Recall" is "Maddzi"'s only contribution to A.L.T., and it's easy to see why. It's an enormous map whose 400+ monsters seem to barely populate it, but there are plenty of breathtaking sights, and while the monsters may seem few, they're a force to be reckoned with. The opening section is in an enormous, Hellish cavern, where most of the action takes place. 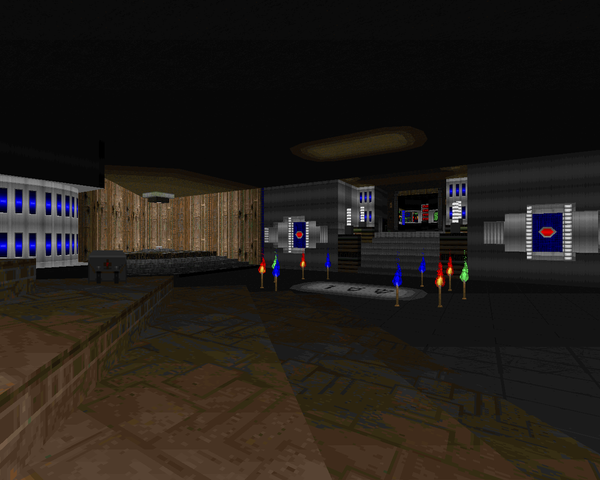 From there you'll access a hub of sorts, which takes you through a number of different mini-maps, including a cool spaceship / military installation with sliding doors. The enormous, sprawling staircase is a definite highlight, especially when the ceiling comes down. The only personal low point for me was the immense lost soul void, but that was more due to the prior squandering of health due to poor play. An excellent adventure. 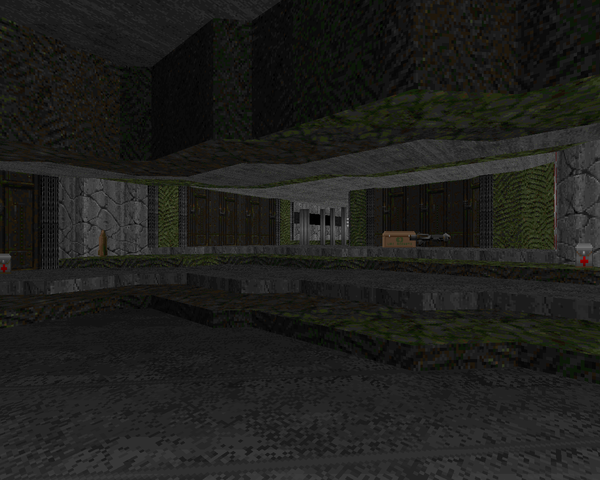 A more traditional yet modern map that takes place in a series of techbase rooms on either side of an underground gorge, separated by teleporter pads. It's a little sneaky, but not overwhelmingly so, and TGA has secreted plenty of powerups to give clumsy players some leeway. 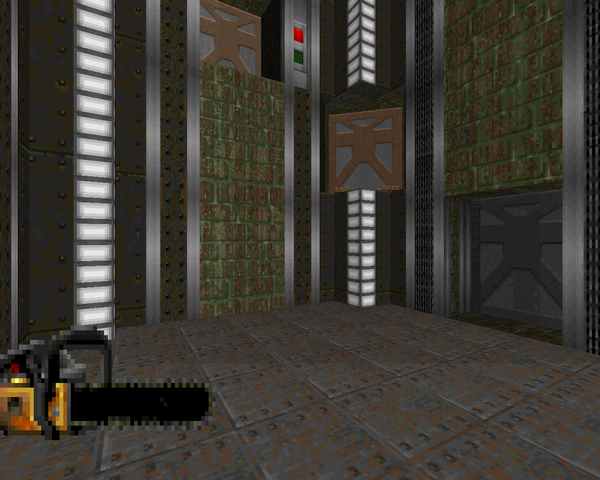 It's got the DOORTRAK texture plastered in a lot of places you don't typically see it (i.e. not in door tracks) but after a minute or two you get used to it. The action is pretty good, if a bit claustrophobic. The red key pit is a bit of a misstep, as taking out the arch-vile and his baron bodyguards is pretty clumsy, but I had plenty of fun fighting my way through the rest of the level. An enormous, exploratory map based around several toxic cisterns. It's loaded with secrets and optional areas. Keep an eye out for hidden switches and you could net yourself some pain-free weapons. There are at least three accessible red keys floating around. You only need one of them to finish the map. Fights are generally quite big or centered around a few toughs, emphasizing maneuverability. There are actually quite a few puzzles, too, like the gallery of skull switches to the north or the revenant / arch-vile gauntlet in the map's southern wing. I'm not sure what I'd call the standout encounter; either the rocket launcher ambush to the northwest or the plasma rifle ambush to the north, the latter of which has some great infighting potential. Very cool but very exhausting map. 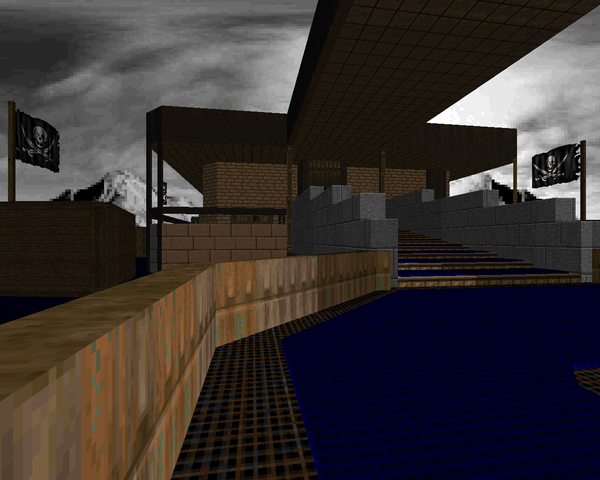 The toxic chute dumps you into a more traditional (but great-looking) underground level with nukage here and there. Azamael makes the map longer than it looks through a lot of dead-end backtracking with monsters repopulating familiar areas at several places. The best example is the whole northwestern area, where you have to fight through the toxic pits, then backtrack with a ton of commando closets opened up to the other sewer leg, which brings you to the locked yellow key area, filling the path back to the beginning with quite a few monsters. Detractors of Eternal Doom may want to look the other way. There are still some great fights, though, my favorite being the room locked behind the blue key door. The monster composition isn't that dangerous but the layout paired with a few surprises may catch you with your eyes glazed over. This is a puzzle map with a very distinct look thanks to the use of light and shadow and sticking to the blue / white color scheme. 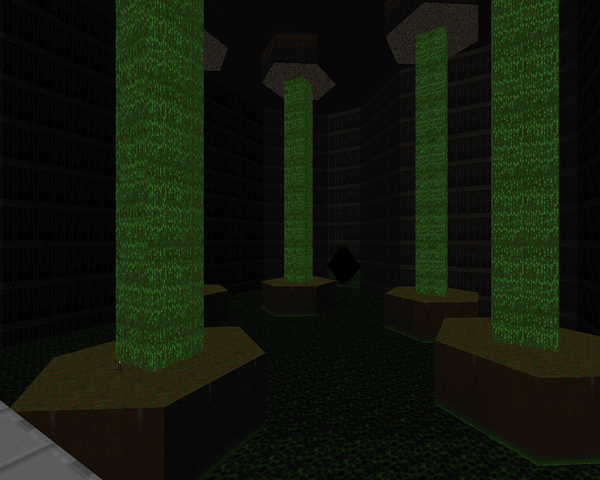 The big stumbling block here will be the blind teleporter maze. Picking the wrong direction will teleport you back to the beginning; the right one will illuminate the previous tile, telling you which sides are "safe". Just ignore the cacodemons – Falcor thoughtfully dispatches them later. The crumbling ethereal highway has a potentially nasty fight (a ton of pain elementals) but the real surprise is walking backward through E1M8 and MAP01, where arch-viles appear that start to resurrect the corpses of monsters slain so long ago. Very unique level; not to be missed. ALT's first secret level is a large puzzler with several key secrets. As you'll discover, the playing area is crammed into several smaller sections in the shape of [B0S]. The B is a dark cavern with not too much action except for the red key trap. The 0 is a more novel segment which leads you around a circular arena with a few tricky encounters before a brawl in the center. The S is the most complex area, featuring multiple tiers of play in a winding outdoor cityscape boasting the WAD's title (emblazoned on a rooftop). It was my favorite to pick through, as you'll have to watch for snipers while tackling the baddies on the ground. 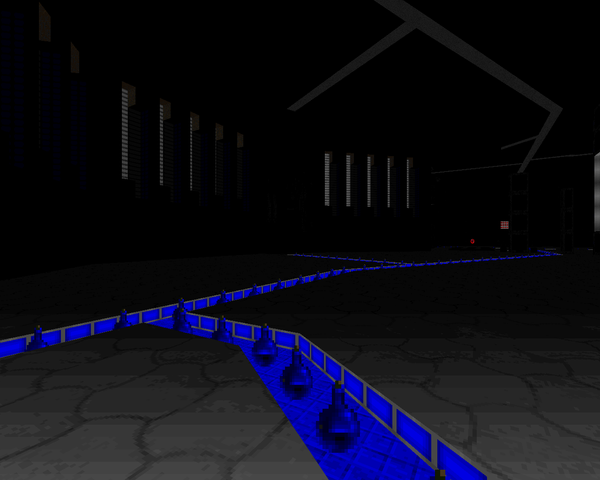 The big secret gauntlet (the left bracket) is plain but serviceable, with BeeWen theming each room's textures around the resident enemy. The right bracket is a pure nightmare, though. Very fun map. BeeWen's second offering is a very short level with a few death traps. 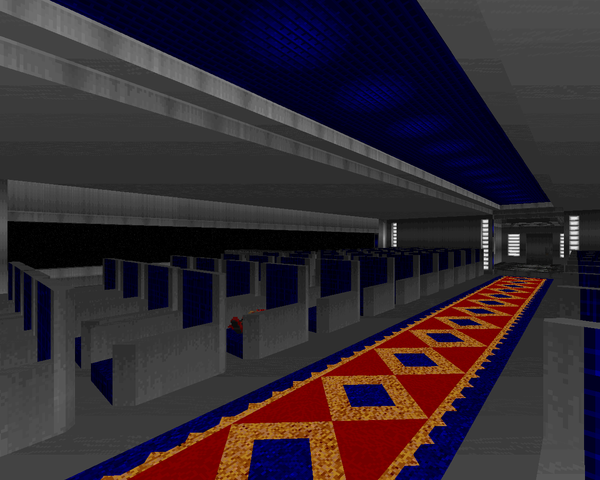 Its simple layout belies difficult segments like the blue key room, where column platforming is exacerbated by pitch-black lighting and a few roaming specters you're liable to miss. He thoughtfully gives you a few platforms once you reach the halfway point, though. The worst fight you'll endure is probably the northern chamber, a cramped battle with four revenants and two mancubuses you'll want to navigate with the plasma rifle. 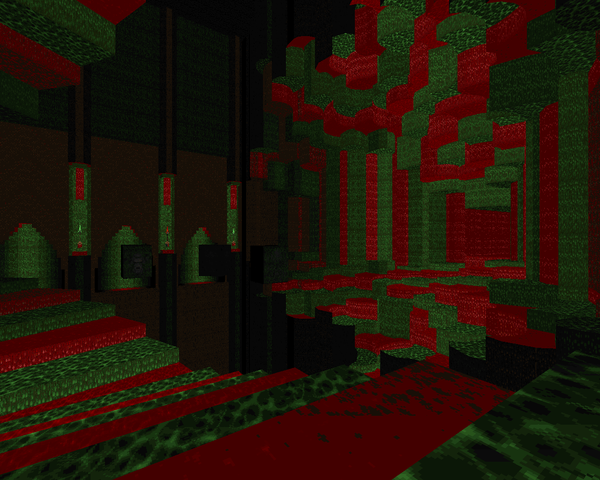 I have no idea what's up with the southern room, where BeeWen has eight arch-viles and a Cyberdemon locked in stasis. It's a very cool visual, at least. Don't let the booby traps discourage you from this quirky little outing. Azamael dishes out another complex base-like map. Actually, with the exception of the secrets, it's pretty straightforward, but without them, you'd be limited to just the shotgun, chaingun and rocket launcher for weapons. There are some great set pieces like the giant crossed arches in the first outdoor yard or the eastern area and its molten cistern. Though the enemy count is down from other Azamael maps, you'll find no shortage of tricky battles, like the sneaky arch-viles in the darkened southwestern room or the tiered toxic roof to the north. The map may prove stressful to those not adept at secret hunting, but I had a fun time with it. Another techbase, this one inundated with nukage. 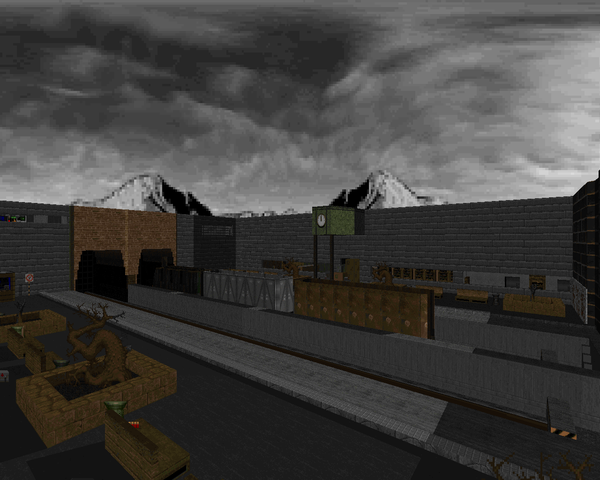 It's got a similar style of progression, as you kind of have to feel out which part of the map you want to tackle first. Highlights include the secrets, of course, one of which sends you on a merry romp where you can neuter several nasty ambushes. 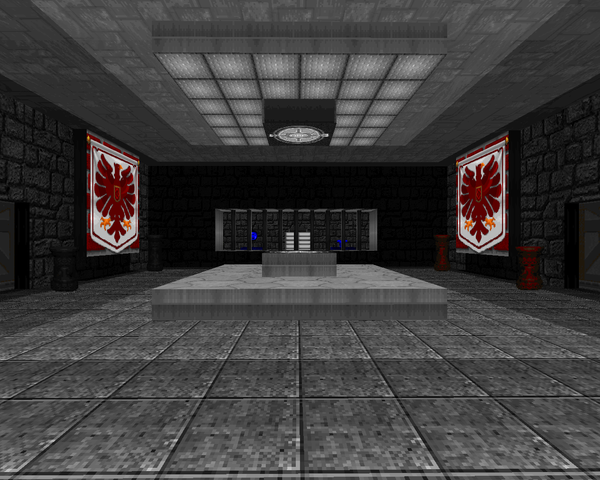 I also liked the room with rising columns of nukage, which requires some conservative gunplay. There's plenty of cramped combat, though you may not enjoy the segment where you have to feel out a handful of specters in a pitch-black cavern. The only serious misstep is the crusher / telefrag room, by virtue of the narrow floor spaces you have to slink through. Misjudge the width – you can't look at your feet – and you're going to die. Otherwise, very cool, with a nice Spiderdemon finale. TGA installs another express elevator to Hell for this nasty outing. It's short, but like TEETH, it's crammed full of nasty, difficult battles in cramped quarters. Several times you'll be ambushed in such a fashion that you have to fight your way out, or more accurately, kill some enemies so that you actually have space to maneuver. 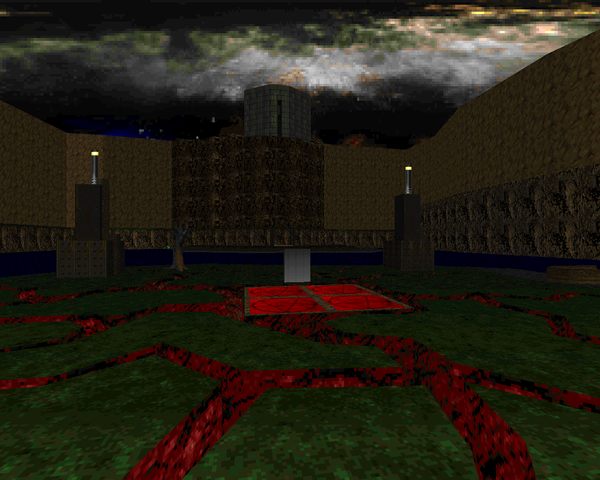 Also like TEETH, you will want to find most (if not all) of the map's secrets, because the well of souls located near the bottom is indispensable, not to mention the BFG, which gives you much more leeway with the map's finale, kind of a "Tricks and Traps" x 4... and you're standing behind the Cyberdemons. Excellent (if brutal) level. Azamael closes out the second episode with another reality-bending romp through Hell that's not short on visuals. Just witness the enormous bloody sinkhole around which the level is based, and the toxic filigrees that surround the exterior ceiling. Or, for that matter, the northeastern crater and its titanic infernal columns. The map is pretty simple in terms of progression, with a few bouts of attentiveness required. While the little gatehouse to the northwest was easy to bypass, I missed the opening in the southern railings entirely, and the red key is another exercise in dead end backtracking. Combat is pretty good with tense bouts like the hell knight shootout on the edge of the crater, the mancubus / imp wave on the bloodfalls, or that very nasty ambush in the southwestern teleporter room. All in all, a great milestone. 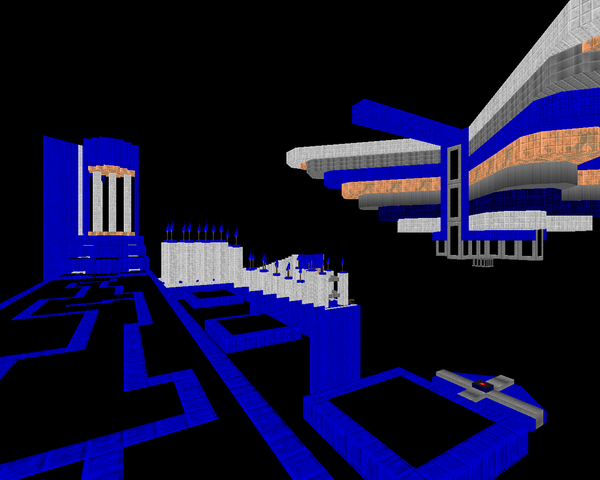 BeeWen's official entry is a large, puzzle-tacular techbase that's inundated with nukage – hence the "Acid". Your first order of business is navigating the southern area, where you have to locate all three keys, a feat made difficult by all the toxic floors (plenty of rad suits) and the layout, where you'll return to the central room several times trying to find everything. Some cool moments here, like lowering the blue key guardian into the playing area, and the complex chain of events leading to the BFG. The northern area involves a switch puzzle with some sneaky use of the light amplification goggles, the toughest moment being (for me) the wave of revenants. The final area has some monster mobs and a cool Spiderdemon battleground where the blood from the upper walkway runs into the nukage for a nice reveal. Excellent outing, and nasty megasphere trap! An industrial complex with a brazen declaration on the road running through it. 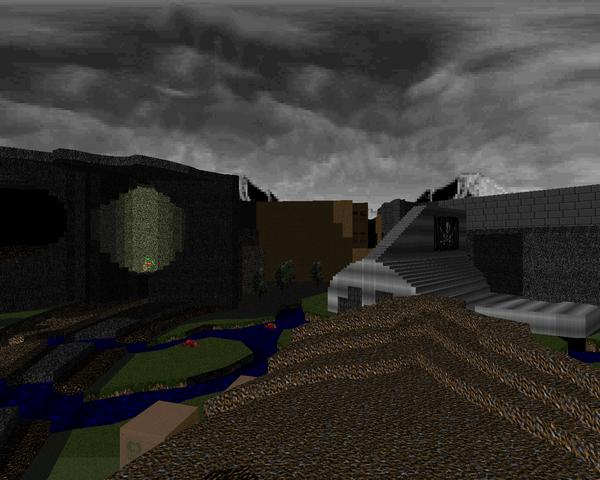 Some neat bits here like the hell knight / cacodemon window pairings and that winding pathway with a scenic view of Hell to the east. 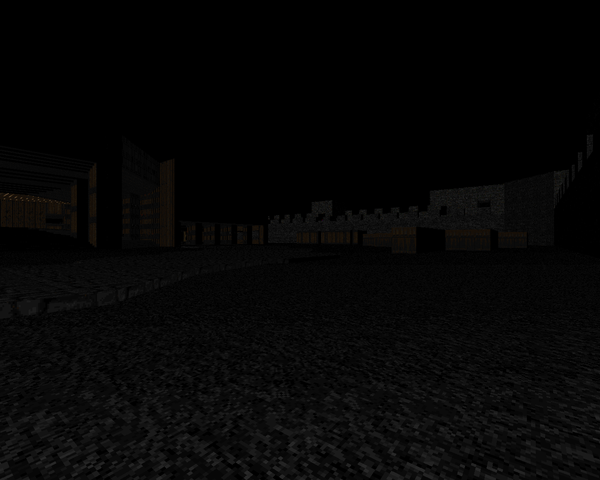 I also like the look of the enormous wall on the compound's northwestern side. 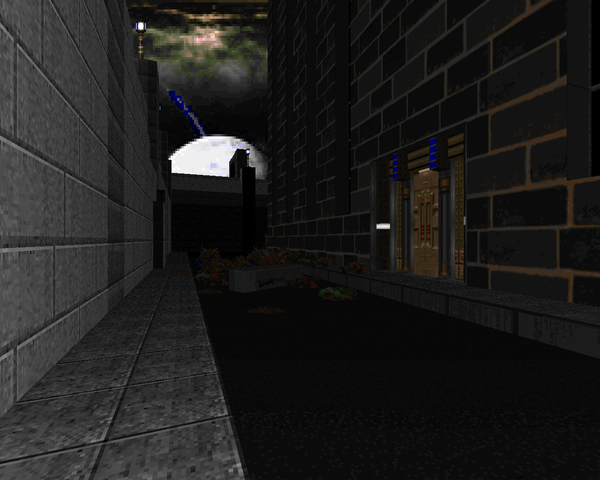 Much of the level is unfortunately concentrated in a very long spiral to the southwest, a never-ending corridor shootout that isn't very interesting, though Azamael rewards your suffering with a hard-earned plasma rifle. Your eventual goal is to grab the keys that unlock some sort of blast shelter. Don't let the monster count fool you. This isn't a super-complex Azamael adventure. Rather, it's one enormous castle which, after a little exploration, results in a firefight of gargantuan proportions. 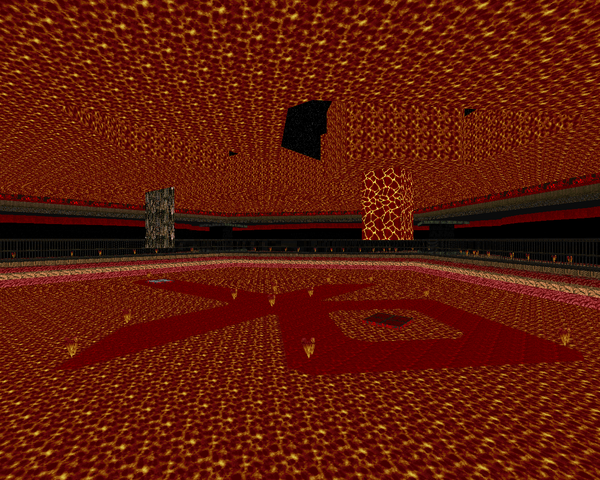 The big change occurs after running through a damage floor maze that's obscured on the automap. 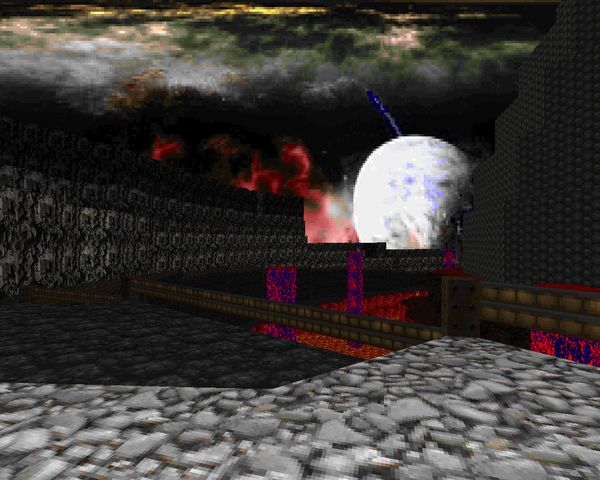 Then the Cyberdemon cages open and Hell is unleashed. Infighting will do most of the work; just watch out for the pain elementals, which should grossly inflate the enemy count. I think there could stand to be some more ammo, but you won't be wanting for health. Pretty fun slaughter. 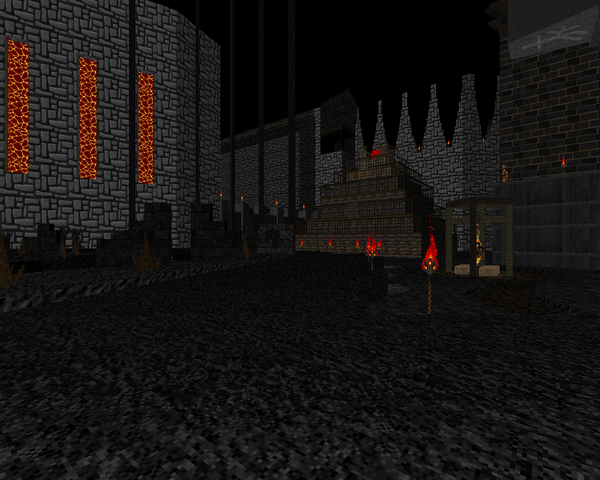 Azamael makes surprisingly good usage of the oft-derided Wolf3D stone texture, here. It lends a very distinct character to these vast, underground caverns. Despite the size, it's a pretty short level, with the potential for an archetypal Gotcha! Showdown. I really like the look, and the final area where the winding path peters off into darkness. One of the features I'm not so fond of are the enemy teleporters to make "insubstantial" foes, but there are only two times you'll find it and they're hardly gamebreaking. Standout encounter, probably the battle after descending the ziggurat, which looses a pack of revenants into your playing area. A dark and moody trip with a unique color scheme, composed almost entirely of green and red cascades. The combination may seem out of season, but it works well and lends itself to some cool visuals, like the vanishing point to the north or the the way the lighting plays on the western alcoves in the same area. Combat is scrappy, with you having to earn your weapons either through fights (the SSG, chaingun and rocket launcher) or through puzzles (the plasma rifle). 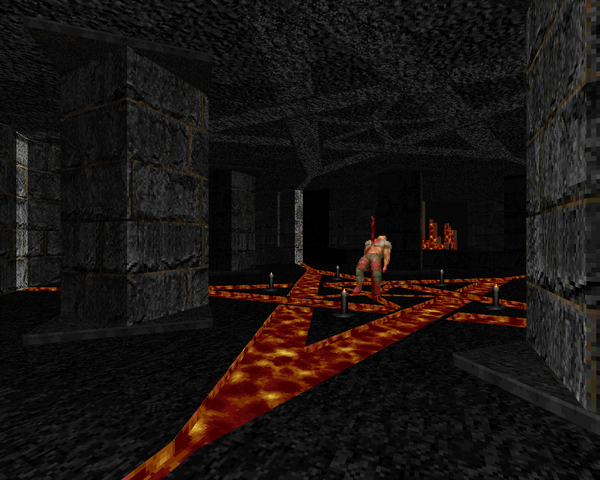 The jail cell area kind of slows the map down, but the looming threat of the spiderdemon helps to balance the tedium of clearing them out with dodging chaingun fire. The finale involves a pretty straightforward teleporter maze. 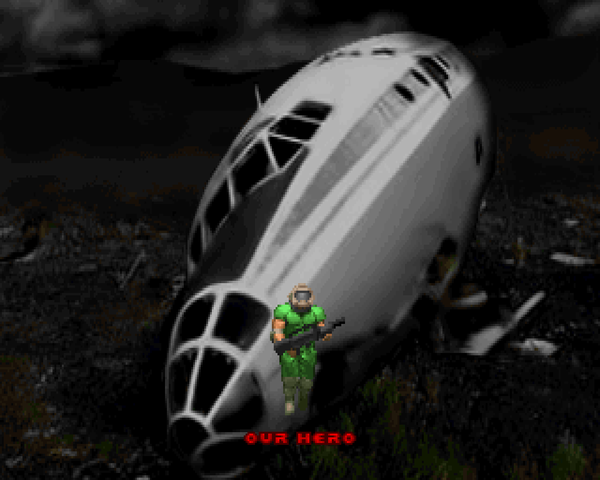 My favorite encounter is the rocket launcher fight, though it'll probably burn you the first run through. Wraith's sole contribution is a map that begins with you picking through a granite slough, followed up with a battle in the heart of a Hellish volcano. It's got a very neat exterior, which you won't truly see until you exit with the blue key, where you fight your way up the spiraling ledge that borders the surrounding chasm. It's a pretty low key affair, the main exceptions being your dip into the caldera and the marble annex past the blue key door, where Wraith has hidden all the arch-viles, probably my standout encounter. Pretty cool level. This level and those following mark the finale. 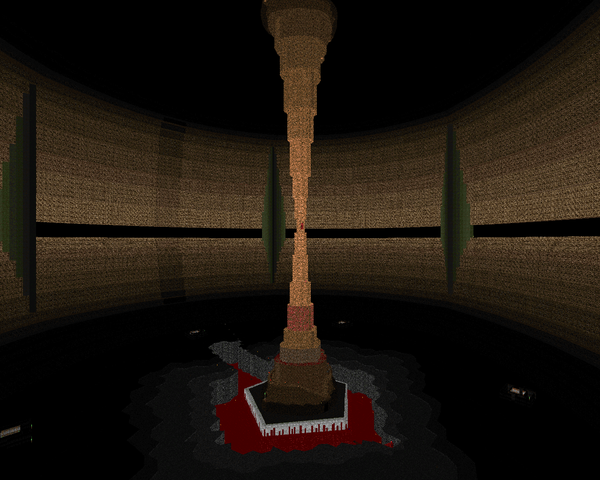 "Gehirn" takes place in an immense, dark and organic dome with a spire of flesh jutting from its center. Near as I can tell, to raise the staircase to the center island you must unleash five successive Cyberdemons and then climb up the spire, dodging rockets, before you get the BFG. Then you can go back and take them out at your leisure. Making things difficult are a hail of projectiles from the rogue's gallery in the center and an untold number of spectres running around the darkened exterior, which are sure to gang up on and devour unwary adventurers. "Gehirn", stage two. The sickness is growing, with several new structures emerging from the blood. It's actually a pretty simple map, but a pain to get 100% kills on. The Spiderdemons that take the place of the Cyberdemons aren't the problem, it's the flock of cacodemons that emerges from the exit hole, which you access by flipping the various eye switches located around the spire. Nothing exciting, besides an enormous pack of revenants. The payoff is at the end, where you're returned back to the plane crash that started this thing, in "Dead By the Down", using those washed-out textures from "Freeze". Cool callback, setting up the ending. 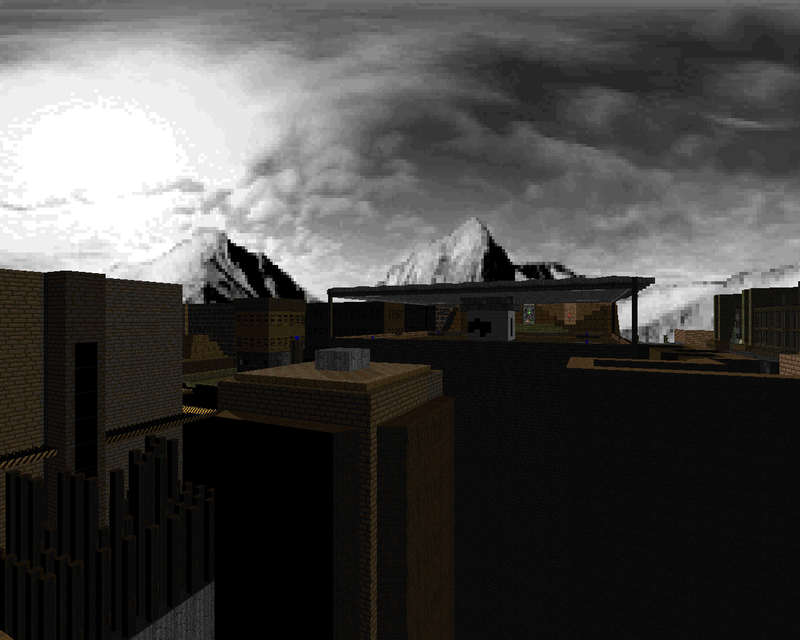 Playing through this at the moment, most of the levels have been well designed, but in a very "non-traditional" form particularly with the plane crash / city levels at the beginning. MAP14 is where I'm up to right now, excellent level, but I think it has a bug: the top-left section with the crushers is impossible to exit. There's only one physical entry point - a silver door at the south end - but once one has entered it, it can't be opened from the other side. The obscured automap passages were sometimes really annoying me as it needlessly increased difficulty to maintain orientation in these huge levels, and it's especially bad during the finale. Other than that, I liked the atmosphere in this wad a lot - it starts with a mystery which is resolved at the end. For the visuals alone, it is more than worth playing through. Could have needed more ammo in some later levels, though, at least IMHO. Better don't miss too often. At the end of the day, a must-play. It's a fantastic megaWAD, and I wish I had tried to bully it through for a 2012 Cacoward. I very likely could have.